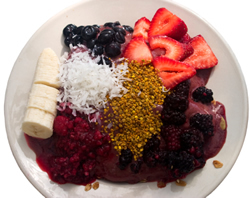 Acai freeze dried powder makes a great antioxidant smoothie. Enjoy in the morning or as an afternoon pick-me-up. Recipe Instructions: : Blend until smooth. You can also use frozen yogurt/and or bananna instead of ice.